Appalachian Ballet Company will present PETER PAN, March 23-24. 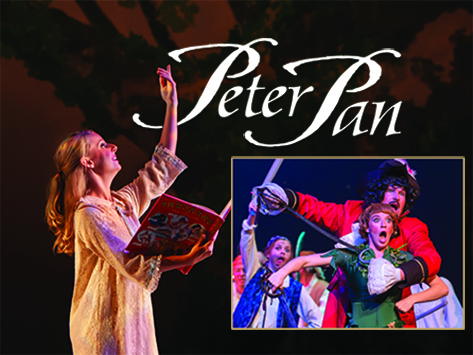 This adventurous production featuring a Peter Pan that flies will send you to Neverland with the Darling children. Come experience the magic of The Appalachian Ballet Company’s Peter Pan which is filled with lavish sets, scenery, costumes and more. Kylie Morton Berry will once again dance the role of Peter Pan with Len Causey as her Captain Hook. Pirates, Indians, Lost Boys and a drum circle will entertain you and your family. The production will be held at The Clayton Center for the Arts in Maryville; Saturday, March 23, 7:30 pm; Sunday, March 24, 3:00 pm. Tickets on sale now at ClaytonArtsCenter.com; advance Adult price - $25; advance Student price - $20; at door - $30-$25.